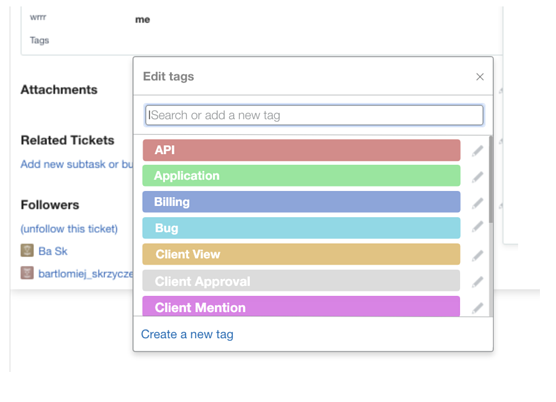 Organizing and tagging tickets just got easier. You can now color code tags in 8 different colors for better ticket management. Coloring your tags can allow for better organization, especially for tickets with multiple tags. Related tags can be categorized using the same color, making it clear at first glance that they’re related. For example, all bug fixes might be red and tags regarding new features being developed might all be colored blue. In this way, users can determine at a glance what kind of projects they are looking at, depending on the colors of the tags associated with a ticket. Alternatively, tags could be colored according to the team they concern. For example, UI improvements could be a different color than programming issues. To colorize your tags, select the pencil icon to the right of a tag when in the tags menu. This will bring up the edit tag menu, along with the option to select the desired color for the tag. For more detailed instructions, check out Using Colored Tags.